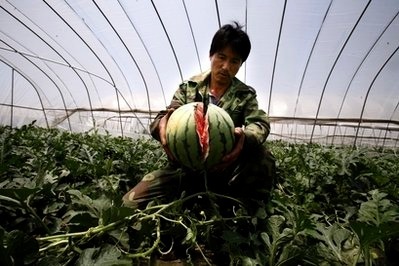 BEIJING – Watermelons have been bursting by the score in eastern China after farmers gave them overdoses of growth chemicals during wet weather, creating what state media called fields of "land mines." About 20 farmers around Danyang city in Jiangsu province were affected, losing up to 115 acres (45 hectares) of melon, China Central Television said in an investigative report. Prices over the past year prompted many farmers to jump into the watermelon market. All of those with exploding melons apparently were first-time users of the growth accelerator forchlorfenuron, though it has been widely available for some time, CCTV said. Chinese regulations don't forbid the drug, and it is allowed in the U.S. on kiwi fruit and grapes. But the report underscores how farmers in China are abusing both legal and illegal chemicals, with many farms misusing pesticides and fertilizers. Wang Liangju, a professor with College of Horticulture at Nanjing Agricultural University who has been to Danyang since the problems began to occur, said that forchlorfenuron is safe and effective when used properly. He told The Associated Press that the drug had been used too late into the season, and that recent heavy rain also raised the risk of the fruit cracking open. But he said the variety of melon also played a role. "If it had been used on very young fruit, it wouldn't be a problem," Wang said. "Another reason is that the melon they were planting is a thin-rind variety and these kind are actually nicknamed the 'exploding melon' because they tend to split." Farmer Liu Mingsuo ended up with eight acres (three hectares) of ruined fruit and told CCTV that seeing his crop splitting open was like a knife cutting his heart. "On May 7, I came out and counted 80 (burst watermelons) but by the afternoon it was 100," Liu said. "Two days later I didn't bother to count anymore." Intact watermelons were being sold at a wholesale market in nearby Shanghai, the report said, but even those ones showed telltale signs of forchlorfenuron use: fibrous, misshapen fruit with mostly white instead of black seeds. In March last year, Chinese authorities found that "yard-long" beans from the southern city of Sanya had been treated with the banned pesticide isocarbophos. The tainted beans turned up in several provinces, and the central city of Wuhan announced it destroyed 3.5 tons of the vegetable. The government also has voiced alarm over the widespread overuse of food additives like dyes and sweeteners that retailers hope will make food more attractive and boost sales. Though Chinese media remain under strict government control, domestic coverage of food safety scandals has become more aggressive in recent months, an apparent sign that the government has realized it needs help policing the troubled food industry. The CCTV report on watermelons quoted Feng Shuangqing, a professor at the China Agricultural University, as saying the problem showed that China needs to clarify its farm chemical standards and supervision to protect consumer health. The broadcaster described the watermelons as "land mines" and said they were exploding by the acre (hectare) in the Danyang area. Many of farmers resorted to chopping up the fruit and feeding it to fish and pigs, the report said.